Government limits THC levels in edibles. 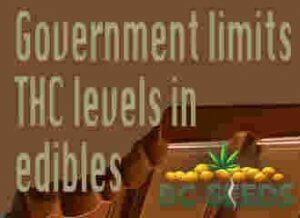 Canadian Centre on Substance Abuse (CCSA) is calling for a limit of 5 mg THC in edible packs to protect the public. Created in 1988, it is a non-governmental charity with a legislated mandate to reduce harm from drugs and alcohol. Providing leadership on cannabis policies, the CCSA has made a submission to Canada Health to change current regulations. With cannabis becoming legal in October 2018, edibles have a current 10 mg THC cap per packet. In its brief to Canada Health, it voices its concerns. There is a chance children or adults could consume edibles by accident with an adverse effect. THC in cannabis can take a while to take affect after ingestion and be stronger compared to smoking it. The CCSA believes smaller pack limits can increase dose accuracy and reduce the effects of accidental doses. Jessesman said the CCSA wants to protect children who eat edibles by mistake. Government limits THC levels in edibles is necessary. As it stands, a chocolate bar can contain up to 100 mg in a pack, even though each piece only has 5 mg of THC. Restricting packs to 5 mg of THC will limit health emergencies in children if they eat cannabis edibles. She said the CCSA wants to avoid the situation in Colorado had in the first year of legislation. There was a 50 percent jump in calls to the poisons line for accidents involving children. The CCSA also recommends that packaging and labels contain useful information. They want to limit marketing information on labels. It said labels should contain dosage information to inform people how to take the product safely. It also recommends that packaging information include “a guide to dosage equivalencies across product types, time to onset, duration of effect and package proportion of the personal possession limit.” This will help educate people on how much THC a package contains compared to the legal limit. CCSA supports that packaging does not make claims about health or cosmetic benefits, as there is only anecdotal evidence. The CCSA supports using clear, plain language about doses to prevent taking too much. In its brief, the agency acknowledged its recommendations were strict. They said this was because it is easier to relax strict regulations if found unnecessary in the future. It is much harder to impose stricter regulations in hindsight. The CCSA says this approach costs industry less in the long run if there were negative impacts.